Giving a German taster lesson? Or just need a fun German quiz for beginners? 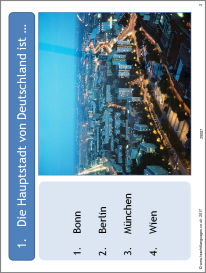 This quick quiz, with answers provided at the end, combines accessible language and interesting facts about Germany. There are 20 questions.